My 10-year-old sister made up a song about this soup because she likes it so much. It’s a cinch to make, and kids love to help out. A comforting slice of cornbread is the perfect side. If your jars and cans of soup ingredients are different that those listed by a few ounces, don’t worry – the beauty of soup is that it isn’t too precise. Add a romaine salad with diced red pepper and your family will hug you! 1) Start by making the cornbread. Center a rack in the oven and preheat the oven to 400 degrees F. Spray a 9” round cake pan with nonstick oil spray. 2) Whisk together flours, cornmeal, sugar, salt, and baking powder in a large bowl. Add egg, milk, and oil and stir with a spoon until batter is homogeneous – be careful not to over-mix. 3) Pour batter into prepared pan and bake for 25 – 30 minutes or until golden brown and a knife inserted into the center comes out clean. Cool for 5 minutes and slice into pie wedges. 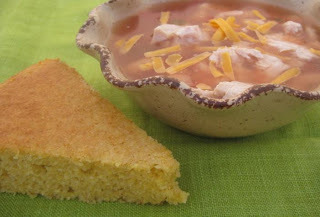 4) While cornbread is baking, combine all chili ingredients (excluding cheese) in a large saucepan. Cover and place over low heat. Allow to heat until cornbread is ready. 5) Serve soup with cheese and cornbread wedges with butter and honey.